Finding the words to describe my spiritual experience always is challenging for me – and this from a writer! My scientific, analytical, linear mind seeks to name the mysterious presence within and outside of me that guides me and connects me to time, places, and people. I grew up calling that essence God and still do. But now, that’s just one of many words I use to talk about the spirit that is ever-present in my life. Bill Taber’s Four Doors to Meeting for Worship (Pendle Hill Pamphlet 306) is loaded with images and metaphors that speak to my understanding of God and the mystical experience of Quaker worship. My Meeting ordered a stack of Taber’s pamphlets recently, and in early December, several of us got together to discuss it; that gathering was the initiation of a “Quaker Book Group.” All of us who met had read Four Doors to Meeting for Worship previously, and we all again found resonance with our own experiences of God and worship. Taber suggests that worship offers an opportunity to “enter a reality which has always been there from the beginning of time, waiting for us to join it,” and he uses the image of an invisible stream we can step into at any time. Perhaps Taber’s imagery speaks to me because I live in the Pacific Northwest, and during this especially soggy rainy season, streams all around are making their presence known. Yet even in the driest days of summer, I know they’re still there, burbling softly toward rivers and the ocean. 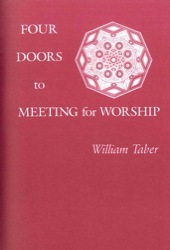 Taber uses the metaphor of a door to discuss the stages of entering into the stream and going deeper and deeper into it to experience the fullness of Meeting for Worship. My encounters with Spirit typically involve passing through different stages as well, as I move inward, shedding my ego, where, as Taber describes it, the “…analytical mind is cushioned in a vaster mind with access to wider ways of knowing.” That’s what often happens for me when I write, and perhaps why my writing practice sometimes feels much like my spiritual practice. For the past week, though, I’ve not stepped into the stream much, at least not in my usual ways. My husband and I traveled by train from Seattle to New York (likely the inspiration and focus for future writing) for the holidays with our children. I’ve not followed my typical routines of quiet centering, journaling, and writing to more consciously enter the stream. But I know the stream is there, and that I’ve dipped into “brief moments of communion” with it, reminiscing with my adult children about their childhood and shared experiences; seeing the city and the wider world through their eyes; snatching some few moments of solitude before the day’s flurry of activities begins. As I write, I’m entering Taber’s “Door Inward,” the time of inward focus to prepare for Meeting for Worship. Today, instead of with my small Quaker group on Lopez, I look forward to stepping into the stream with others at Brooklyn Friends Meeting.